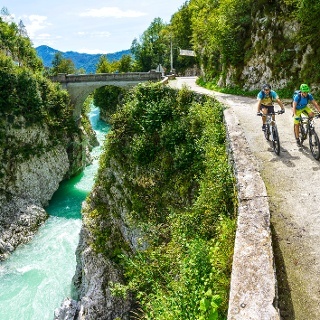 The tour takes us fro Bovec over Kolovrat to the village Kal-Koritnica from where we descend to the Soča river and cross it over a hanging bridge. Between the villages Jablanca and Čezsoča we make an ascent left up on the forest gravel road to the rockfall on mt. Javoršček. 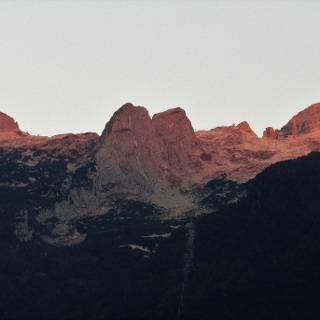 From here, a wonderful view of the entire Bovec basin opens up to us, paying off all our efforts. When we get enough rest and have fully enjed the view, we descend to the Čezsoča village, again cross the Soča river, ang go left up the gravel road to the Bovec plateau, we then go around the airfield back to the center of Bovec. You can shorten the trail by dropping the ascent to the viewing point at the rockfall on mt. Javoršček. The descent from the village Kal-Koritnica to the Soča river is more demanding. Less experienced bikers better walk with the bike in the hand. Cross the hanging bridge on foot, with the bike in the hand. On the way, you can refresh yourself in the village of Kal-Koritnica in the restaurant "Hedvika" or in Čezsoča village in the restaurant "Vančar" or "Čezsoča". From the centre of Bovec, this tour leads via the main road toward Mala vas, where at the Felix Bar a left turn from the main road is made. 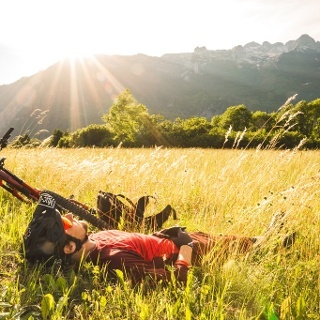 Here, continue right and cycle along the brook through Mala vas and further across the meadows and parallel with the main road up to the junction with the B4b walking trail leading to Ravni Laz. At the junction, keep straight and cycle further until the main Bovec-Log pod Mangrtom road is reached. Here, cross the main road and leave it again after some meters where there is a right branch-off for a macadam road. 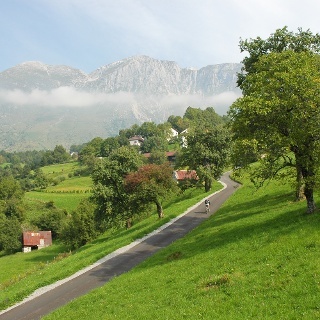 The tour continues along this road up to a hanging bridge where a right turn is to be made to the “Kukč” homestead. Further along, there is rather steep ascent, followed by a not-too-steep descent to the village of Kal-Koritnica. 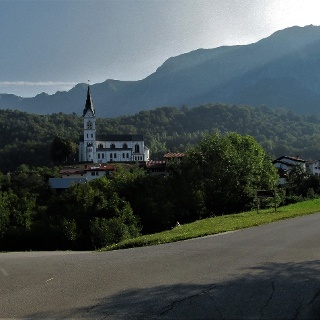 The tour continues through the village up to the junction for the main Bovec-Trenta road, where you turn left for Trenta; however, leave the main road again after 100 m at the right branch-off for the hamlet of Jablenca. Next is an interesting descent via a footpath to a hanging bridge over the Soča River. After crossing the bridge, there is a short ascent to an asphalt road. Here, turn left in the direction of Zmuklica and continue up to the end of the asphalt road at the Štefan homestead. From here, the walking trail for Kršovec is followed. After a kilometre of more demanding trail, where the bike has to be carried in some sections, a cart track is reached. At this point, turn right up the slopes of Javoršček mountain. An uphill section is followed by a short, flat one, and then by a junction with a macadam road. Here, turn left and make an extra trip to a vantage point situated 200 m of altitude higher at the landslide on the slopes of Javoršček, or turn right and descend to the asphalt Čezsoča-Jablenca road. At the junction with the asphalt road, turn left to Čezsoča and from there right and across the bridge over the Soča River. Soon after the bridge, turn left and cycle uphill to a flat section. 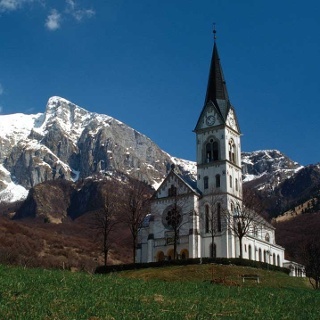 Here, the tour leads right and, via the airfield, brings you to the starting point in the centre of Bovec. We can reach Bovec from Austria and Italy across Predel pass (1.056 m), from Gorenjska region via Vršič pass (1.611 m), from the south from Tolmin, Kobarid. Free parkingplace at the Bovec cultural house near the centre.